The Delicate Fate of Pacific Coast Trail Runs - Will It Survive? It was Pacific Coast Trail Runs (PCTR) who first introduced me to ultramarathons in 2001, helping me rediscover a passion for the outdoors with their unique trail events up and down the West Coast. 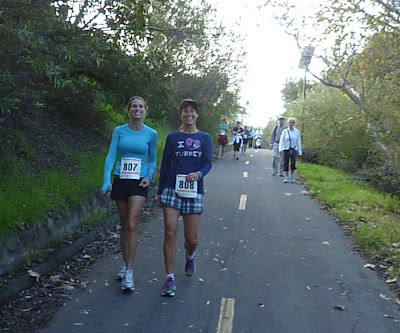 PCTR's fun and low-key “runs but not races” have been a big part of the California trail running community for over a decade (beautifully chronicled here by Sarah Lavender Smith for UltraRunning Magazine in March, 2009). Rarely a month goes by that I don’t recall the fateful day I met PCTR Race Director and co-founder Sarah Spelt managing an aid station for the Purisima Creek 50k near my house, and watched her help a runner finish vomiting, pull him up, and say, “you only have 5 miles to go…so get out of that chair and keep moving forward”. Wow! Runners and volunteers alike were friendly, tough, courageous…a group of passionate people creating adventure just for the hell of it. Like many, I was drawn in by the PCTR aura. Lately, that aura has had to shine through some dark times. To say that 2011 has been a tough year for PCTR would be an understatement of ultra proportions – cancelled races, a no show for an event, tens of thousands of dollars in refunds in limbo, a rotating door of co-RD’s, and more - any one of these would be enough to set the tombstone on even the best event management company. But just when you count them out, PCTR comes back with dogged persistence. As 2011 comes to a close, they face their toughest challenge yet, and all eyes are on the Rodeo Beach 50k on Dec 31st to see if the race will occur, and more importantly, if PCTR will survive. 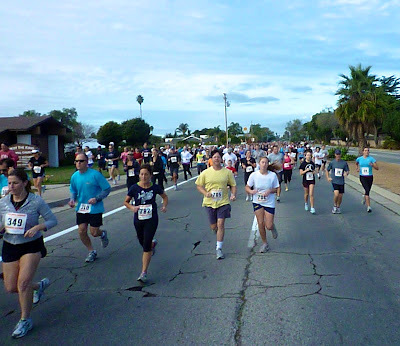 I was lucky enough to be a regular participant in the Golden Age of PCTR, where they held 20+ races annually through 2000-2010, ranging from 10k’s to 24-Hour events, and even birthing the heralded Headlands Hundred. Those who ran knew exactly what to expect – a well-marked course, plenty of happy volunteers, lots of food, and a sense of humility that made even the craziest races (and racers) feel approachable. By 2008, nearly every race was selling out, with a solid mix of regular runners and first-timers motivated by the Dean Karnazes/Born To Run surge. 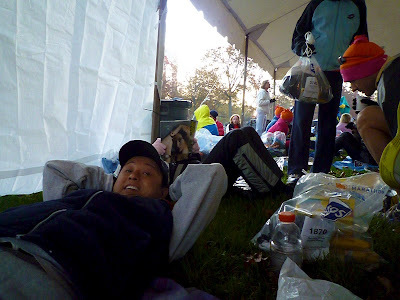 The 10-20k distances seemed to be the cash cow, drawing hundreds each weekend, while the ultras were clearly a labor of love that Sarah and then-husband/PCTR co-founder Wendell Doman both shared with the community they helped build. The Golden Age got its first shake up in mid-2010, when a “Dear Jane letter" from Wendell to Sarah split the personal relationship that was the genesis of PCTR. Some feared the worst in the face of a divorce among co-founders, but they continued to do an amazing job keeping everything going smoothly. Wendell soon after started Coastal Trail Runs with a roster of even more races that conveniently did not occur on the same weekends as PCTR events. Like the child of divorced parents who now gets two weekly allowances, the trail running community was getting a best case scenario from a challenging personal situation. 2011 started ambitiously for PCTR, with a new co-owner and Race Director Michael Popov, new logos and web site, and a plan to expand into a whole new series of races in the Lake Tahoe area. A newly minted PCTR Race Team was spotted everywhere, with runners like Ian Sharman making headlines with his American Record-setting 12:44 at the Rocky Raccoon 100 trail run. Races continued to sell out through the summer, many in record time, although the Lake Tahoe races had to be postponed due to long permit timelines. Still, they forged ahead, and for most of us, the Golden Age was as bright as ever. Then in September, 2011, the "train came off the rails", so to speak. On September 16th, less than 24 hours before the San Francisco One Day event at Crissy Field, an e-mail went out from Sarah saying the event would be cancelled due to a “personal emergency”. Some runners were aghast, having trained and flown out to be at the event, but most just offered their help and condolences. PCTR does races in rain or shine, so surely they wouldn’t cancel an event unless it was serious? The PCTR Facebook page lit up with concern, personal outreach, anger, and lots of questions. The following Monday, Michael Popov announced on Facebook that he would no longer be associated with PCTR “due to personal issues and other numerous issues with the co-owner”. Like many, I was shocked, and began asking around with the PCTR runner/volunteer regulars about what might have happened. Many felt it was a shame that Michael had left, saying he had lifted up PCTR with his enthusiasm and attention to detail. Others were much more direct, implying that Michael’s involvement created a precarious financial situation for PCTR, and his personal style had driven regular volunteers away. Whatever it was, the cancellation of the San Francisco One Day, and now this, was evidence that something deeper was amiss. Then, the unspeakable happened. 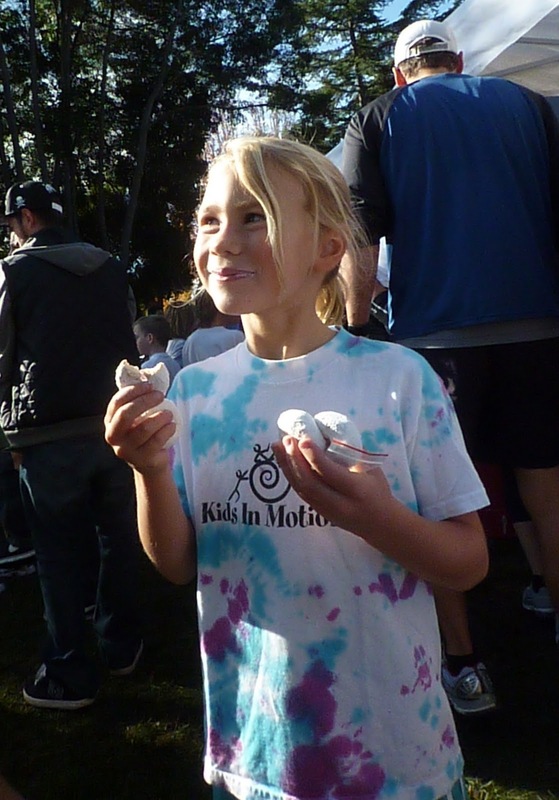 When racers arrived at the Santa Cruz Mountains 10k/20k/50k the following weekend, PCTR was nowhere to be found. La Sportiva was there to demo their shoes, and a couple of volunteers were eagerly awaiting aid station supplies, so it was clear that no notification of a cancellation had gone out. After hours of waiting, runners disbanded and went right to the Facebook page to express their shock and outrage. Just when you thought a last minute cancellation was the worst cardinal sin of race directing, a no-show reset expectations at a whole new level. Refund requests poured in by the hundreds, which unfortunately resulted in PCTR's credit card processing company freezing their account and making it impossible to issue refunds. The PCTR web site posted cancellations for the next two races (Montana de Oro and Redwood Park), exacerbating the refund/frozen account situation, but still processed entry fees for future events through PayPal. This confused many, and while some ultrarunners just rolled with it and asked for credits for future events, the short course masses were extremely vocal about their missing funds and took to the Internet. Runners like Oregon’s Casey Hennig blasted PCTR on Yelp, Facebook, and even filed a complaint to the Better Business Bureau, permanently damaging the PCTR brand. Runner Christine Jenior Gorby said on Facebook she was engaging her lawyer, which as we all know means that PCTR would have to be very careful about any public dialogue (ie, there will be little, if any). Another slighted runner, Greg Monaghan, continues to post to Facebook regularly to call PCTR “scam artists”, "criminals", calling Sarah “a thief”, and encourage runners to go to competitive events. Hell hath no fury like a runner feeling ripped off, and with a lack of frequent two-way communication, they let their voices be heard. It was hard to imagine how PCTR would survive. Then, in mid-October, signs of life. In fact, it was more than signs, it was a comeback in the making. Sarah came out of silence to publicly comment on the frozen credit account scenario, promising refunds to all involved and replying to many personally. A new team was hired, run by Tim Long and Tim Stahler (“the Tims”), two individuals with a deep passion for running and hosting events. Tim Long had even relocated from Colorado, and as soon as he hit the ground, the races were back on. The Santa Monica Mountain event on Nov 20th happened, followed by the Woodside event on Dec 3rd, in an impressive display of last minute organization and high integrity communication about the race directing experience. 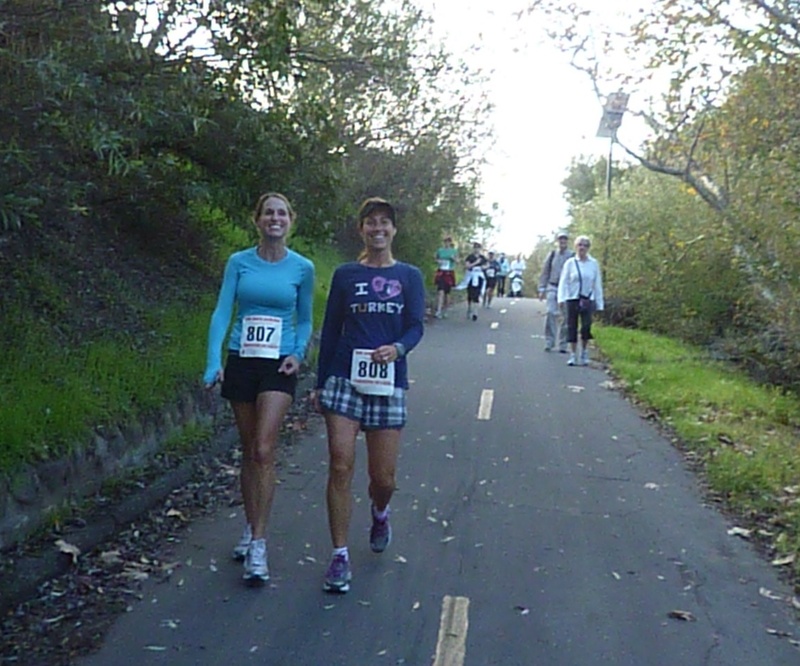 I ran the 25k at Woodside, and it felt like the good ‘ole days were coming back, with ample course markings, food, and happy volunteers. A new PCTR Race Team was announced, and I joined up to help in the comeback story. Like an ultrarunner who refused to drop, PCTR was taking flight once again. Then as fast as the comeback was on, it stumbled. On Dec 17th, the Tims posted a blog entry saying they would no longer be involved with PCTR, citing the inability to address the confusion and frustration around refunds and money owed. They did promise to host the Rodeo Beach event on Dec 31st, and assured everyone that food and supplies were ordered. 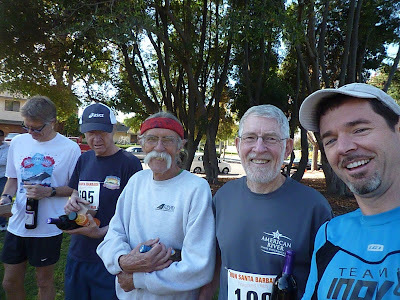 After Rodeo Beach, the blog entry went on to say, the Tims would be creating races under a new event management group called Inside Trail Racing. Yup, that just happened. A few days later, they updated their post saying they had been contacted by PCTR’s lawyer to stay away from the Rodeo Beach event. Lawyers are involved? Uh, oh. Suddenly, everything seems up the air. Will the Rodeo Beach event take place on Dec 31st? Are refunds coming, or does involvement by lawyers signal signs of bankruptcy? All eyes are on Dec 31st. One thing for sure, you can't knock the players in this story for a lack of passion about their sport and community. While Sarah and the PCTR crew find their footing, Michael Popov went on to tackle 140+ mile adventures of his own, Wendell created Coastal Trail Runs, and the Tim's launched Inside Trail Racing. In the face of a DNF, they each found within themselves the strength to press on and flourish in their own way. Their persistence is admirable, and for what it's worth, the trail running community continues to reap the benefits. There is a special place in my heart for PCTR, and I sincerely hope that they will persevere through these tough times. I am ever the optimist, much in thanks to ultrarunning, and can easily picture racing a PCTR event in full PCTR Team gear soon, taking about how glad we are all that refund nonsense is over. It would be yet another epic story of persistence and courage in the face of adversity that our sport creates with welcome regularity. Keep moving forward, people. Try to be positive for those that are struggling through the race. The finish line is closer than you think. "The trail running community is aware of the difficulties PCTR has faced recently. We appreciate the extraordinary patience of our loyal friends and followers. PCTR has retained professionals to work through the immediate issues and help formulate a strategic plan for the future. Among the urgent issues are the processing of all refunds for past cancelled races. Please look on our Facebook page for real-time updates and further instructions for refunds. This process is well-underway and we will keep you posted. We wish everyone a great 2012 - and we sincerely apologize for the recent difficulties!" Jeff went on to mention how they are in sorting out who still needs refunds, and who has already received them through their credit card companies, and how best to process them efficiently. It sounds very positive to me. Mark Remy, known to most of us as the hilarious blogger behind Runner's World's RW Daily, has recently released "C is for Chafing", a funny mock-children's book that captures the irony and inside jokes of the running community. I got a sneak preview copy, and immediately picked up a few more as stocking stuffers. D is for DNF, his GI tract is churning! Thank you, Way Too Cool, for wanting me! I nearly bottomed out on the lottery karma this month (0 for 3), but Way Too Cool came to the rescue this morning. Phew! I actually had a cry-in-my-beer blog post drafted called "Hmmm...time to find another sport?". I know I shouldn't anthropomorphize and assume causality in what is essentially a random process, but I can't help it...passion for this sport runs too deep! Hardrock, can I climb your epic peaks and kiss that rock? Nope. Because I know you don't really want to do this race...you're just backfilling in case Western States doesn't come through for you. Western States, oh love of mine, can I toe the line and be an active ambassador for your magical event? You're kidding, right? We called you a THREE TIME LOSER and you still can't take a hint. In fact, nobody publicly calls you a loser as regularly as the Western States Endurance Run, yet you keep coming back. You're actually a SIX TIME LOSER, but in order to publicly call you that, we had to get rid of that pesky rule that actually allowed losers in. Get a grip, man. You have some serious dependency issues, and there are lots of other 100-milers out there...one of them may be your true soul mate but you won't know until you move on. And in case you are wondering, no, there isn't going to be a special belt buckle for ten time losers. Miwok, my old friend, can I share your epic journey? Sorry, pal. We're already full with people who are training for Hardrock and States. Way Too Cool, please tell me I am worthy? The wise person would point out that karma is likely just showing me the wonderful opportunity to volunteer/crew at these great events, camera in hand, and build an even deeper love for the sport. Ah, yes, I hear it now. But as I am woefully finding out this winter, if I don't have a 100-miler on the agenda, my motivation to train drops significantly. So the design process begins...Massannutten? Rocky? Black Hills? Bighorn? UTMB? Oh, the places we will go! 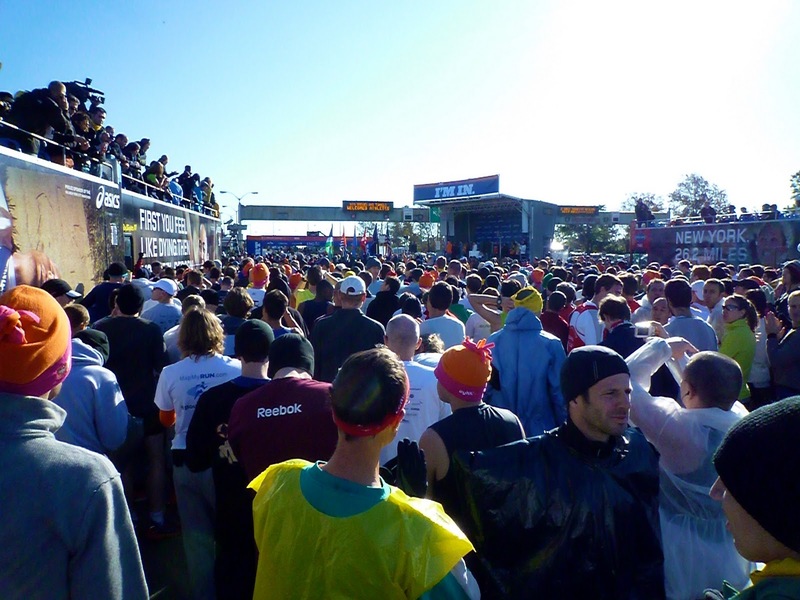 The 2011 Rock n' Roll Las Vegas Marathon, which quickly grew to over 44,000 participants, went from "night run" to "nightmare" this weekend according to this news report and the many Facebook comments. 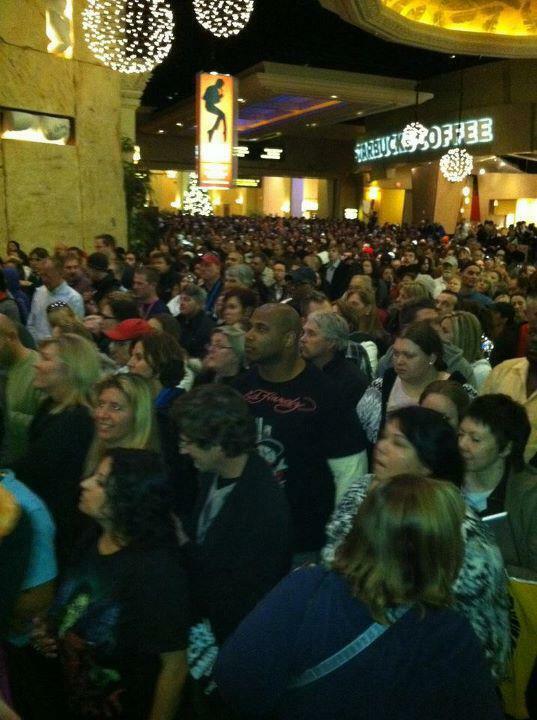 Thousands packed into the Mandalay Bay Hotel at the finish with nowhere to go, stuck for hours, passing out, vomiting, you name it. Now there is a survey posted trying to find the root cause for why thousands have ended up sick. For those who love to watch a good train wreck, be sure to check out the Facebook page that is updated every few minutes for the latest accusations. The CEO of Competitor Group, the race organizer, got married with his wife during the race and they both clocked a finish averaging 6:31 min/miles to win their age groups (no split times recorded, suspiciously). No money went to charity, aggravating many. No medical personnel at the finish. Online petitions to boycott the Rock n Roll series popping up. Those who got a finisher medal noted it has a picture of the Seattle Space Needle. Pretty crazy! And mind you, these complaints come in every couple of minutes FOUR DAYS after the event. Many also say they had a great time, clocked PR's, and had no issues, and at least nobody died (yet). But whoa...the haters are out in force on this one. It gives me a whole new appreciation for the smooth execution of the NYC Marathon with its 47,000+ participants. One forgets how many things have to go right to have these big races run smoothly. The Endurables put together a great video of The North Face 50-Miler from this last weekend, where Mike Wolfe prevailed after racing with Dakota Jones until the last few miles. Good stuff! A survey of the top 20 Turkey Trots held on Thanksgiving last week shows a 14% boost in participation from last year, far exceeding the 1% growth of the previous year. On the day of the year that has more races than any other, some of these are now boasting starting lines over 15,000 runners. Isn't that great? 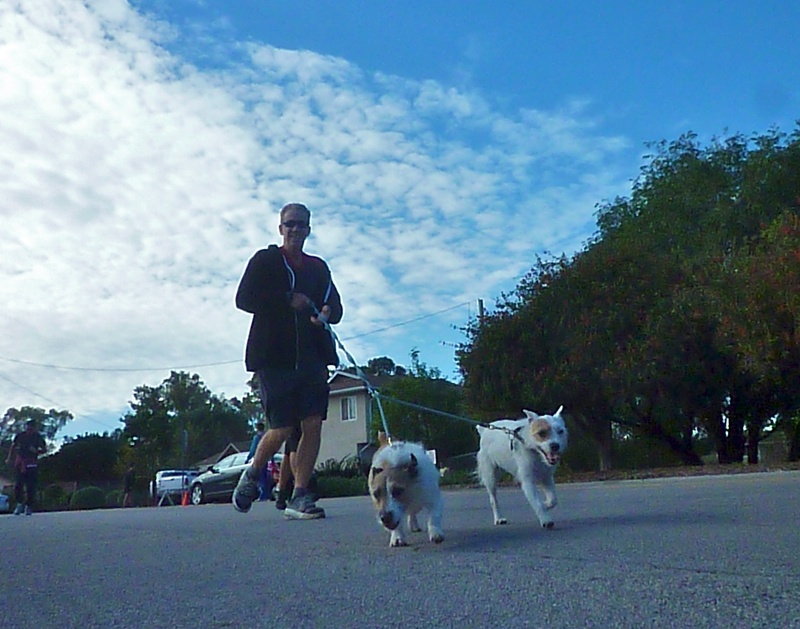 I have now run the Santa Barbara Thanksgiving 4-Miler for five years in row, doing my best to squeeze in under 24 minutes (and 1000 burned calories) and win a bottle of Martinelli's Sparkling Cider for the kids to drink at the family feast. This race reflects the growth of Turkey Trots, climbing from 300 runners in 2007 to over 700 this year, while retaining it's small town charm. I would like to believe I run it for health reasons, but honestly, I know the motivation is to feel less guilty about the second and third helpings of home cooking that I am so fortunate to indulge in each year. 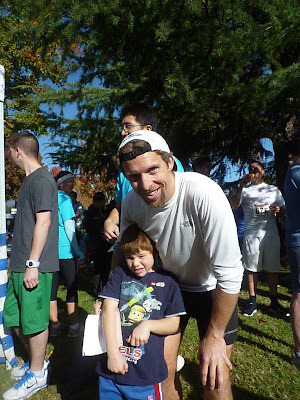 Once I had done the race a few years in a row, however, my motivation changed. 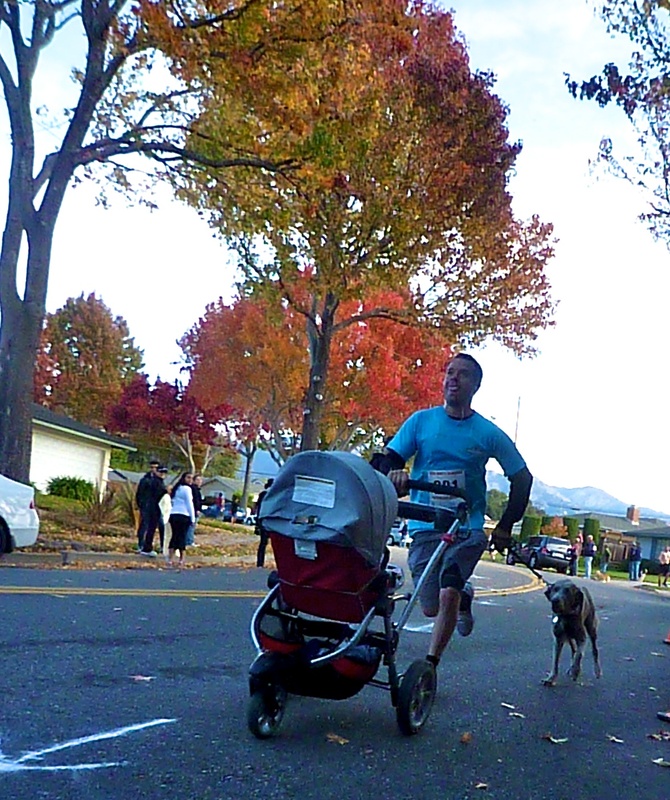 I see the same faces at this race each sunny Thanksgiving morning, and enjoy catching up with them and watching their kids grow. I find myself inspired by the consistency of 76-year-old ultrarunner Bill Dodson, who somehow manages to do this race with his family and still make it to the Quad Dipsea a few days later (and then the CIM marathon the next week, naturally). Or the evolution of the Allison family, whose daughters Kate and Sammie have grown up from spectators (who scarf the post-race donuts) to runners (who scarf the post-race donuts), and soon enough will leave me and their parents in the dust as their youthful jaunts become graceful strides. 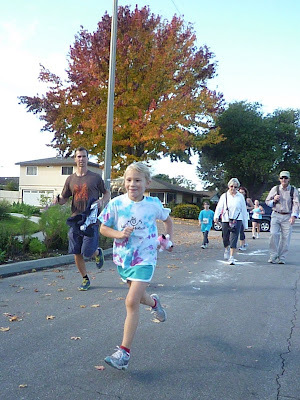 Brian Wyatt was the proud father of 5-year-old Cassidy taking on his first race, and 12-year-old Chaia who easily made an age group podium finish and still had enough juice to run back a few miles and join the family. This year also saw the subtle transformation of my friend Kik Armstrong, run/walking this year with that confident glow of humility only seen on those who just completed their first 50-miler. Consistency, change, transformation...all captured in the time-lapse memory of an annual community event. It's a beautiful thing, really. No wonder they are becoming so popular! Having trouble finding the perfect gift for the trail runner in your life? Here are a few of my favorites that can help get you started - if you know of others, be sure to add them in the comments! Uber-photographer and trail runner Glenn Tachiyama (along with Wendy Wheeler-Jacobs) has consistently put out the most beautiful trail running calendars to raise money for the Washington Trails Association. The gorgeous full-page shots (check them all out here) compliment a complete calendar of ultrarunning events. This year even includes an entry form for free race entries! Few things can spice up the drab cubicle life like a constant reminder of epic trail runs hanging on the wall. I buy 3-4 each year. You can pick one up at ZombieRunner, Rogue Valley Runners, or other stores for $23. The latest documentary from JB Benna's JourneyFilm captures one of the most incredible races of 2010, as Geoff Roes, Tony Krupicka, and Kilian Jornet obliterate course records in epic fashion. This is newly available this year, and will be a favorite for sure. Pre sales begin 11/25. I'm not sure exactly how Kilian Jornet and the gang at Salomon came up with a pack that doesn't bounce at all, but this one has quickly become a favorite of mine. A little on the spendy side, but worth it! Get it at iRunFar. Want to challenge a runner to take a leap to the 100-mile? Buy them a handful of lottery tickets to the 2013 Western States 100-Mile Endurance Run and see if fate will put them on the starting line in June, 2013. Go for the premium package by offering to be their crew! Even if they don't win a slot in the lottery, I bet you get them thinking bigger/longer for 2012. Still available via mail until the drawing on Dec 10th. A great stocking stuffer! If your trail runner is going to open a gift in front of a big group of people, a nice coffee table book is something that can be passed around to get a lot of gasps and admiration. I'm a big fan of Extreme Running by Kym McConnell and Dave Horsely, available at ZombieRunner for $15. For those looking to get into ultras, Bryon Powell's new book, Relentless Forward Progress, is a great one. For the ladies, I would highly recommend Kristin Armstrong's Mile Markers, a witty and adventurous reflection on life and running. GU's holiday flavor for 2011 is Peppermint, a great stocking stuffer! Someday they will make the alcoholic Hot Buttered Rum gel, and I will be all over it. Available at ZombieRunner. Part roller, part massager, the Myorope is a great way to loosen up a tight back, post-race hamstring, or just about any muscle that is giving you trouble. It fits conveniently in a suitcase/briefcase too, far more so than a foam roller. I like it for post-weights recovery, and the "quad" four ball version is best. Did your trail runner have an epic race experience? Go find the photo service that was at the race, and get them a nice framed photo. I know we all rarely buy these things for ourselves, but honestly, how many good photos of yourself running do you have? Unless you are married to a photographer like me, it's hard to get a good shot that can be blown up into a decent photo. Time to splurge! I can ALWAYS find something I didn't know I needed until I saw it at ZombieRunner. Definitely will prompt a smile. Also an easy gift to buy and send instantly. What better gift to give a loved one than the Jackhawk 9000? Available at Wal-mart. (Thank you, Ricky Bobby!) I know I posted this last year, but it's just too funny to skip. If you don't have the cash-ola, give the gift of time with a guided trail running tour of your favorite park. Set the date, make a plan, bring some snacks, create a hand-written card that sums it all up...voila, an instant free gift. And one that will certainly be treasured! If you have a friend who is constantly too busy with kids to do those long runs, give him/her some hand made gift certificates for babysitting. They will guard them with their lives. Phenom runner Lucas Verzbicas, who joined the University of Oregon track team two months ago after a stellar year setting numerous high school records (and becoming the fifth sub-4 minute high school miler in the US), recently quit the team to pursue triathlon and hopefully making an Olympic team. As quoted in the Chicago Tribune, Verzbicas said "As a triathlete, I could really make an impact for the sport and only have good things happen. As a runner, I don't know. Maybe I could be in the top 20 in the world, maybe the top 10, but I wouldn't make such an impact." It appears his recent win at the Junior Triathlon World Championships sealed the deal, and was probably also aided by the fact that his stepfather, Romas Bertulis, was named head of the Elite Triathlon Academy that began in Colorado Springs three months ago. And if you are Olympic bound and not a US citizen, like Verzbicas, triathlon provides better access than track. Hopefully he is voting for his greatest passion, for it would be a shame to see such a talent choose a path because it's the easiest way to be "the best" at a sport. I'm sure his team at UofO will feel the loss. But I am sure he will be fabulous at whatever he pursues. 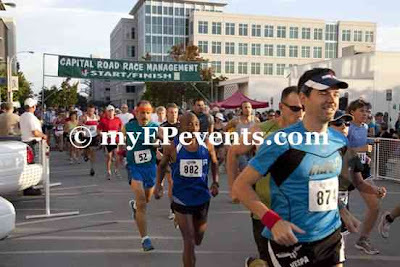 The 2012 Race Lottery Season - Get Signed Up! On the first day, you make the decision. “I’m going to drink more water,” you say. “Eight glasses a day, to start with. Maybe more.” Suddenly you realize the break room has gone silent. The sun sinks below the horizon as a sign of respect. You begin right away, finishing the cup of water already in your hand. Click here to read the rest...very funny. 47,438 runners. 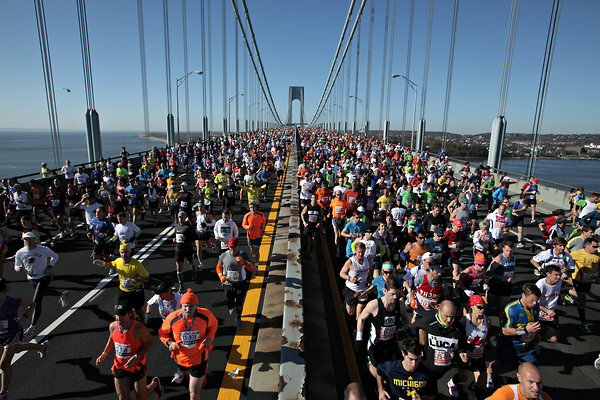 That's a new high water mark for NYC, the biggest marathon in the world. 130 countries represented. For a little perspective, only 120 countries are in the Olympics. 3 million+ live spectators. That's 10x what the Olympics will bring, and about the equivalent of all of Norway showing up (and based on how many Norwegians I met, they were damn close). 2.25 million paper cups at aid stations. 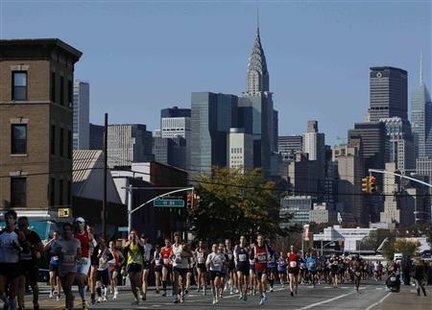 Green party, prepare for "Occupy NYC Marathon". This is a race so big, I just HAD to go check it out. I'm so glad I did - nobody celebrates running like the Big Apple. I'm a bit embarrassed to admit that I put my name in the lottery for the NYC marathon for three years, only to have somebody point out I could submit one of my speedy race times for a "guaranteed entry". Doh! Don't forget to read the instructions, kids! (ha, ha) I just barely squeaked in with a qualifier which, like Boston, will be even tougher for 2012 due to increased demand. I hadn't trained specifically for this race, but felt I had good enough fitness to go sub-2:50 on a good day. And a good day it was! Sunny and high 40's with no wind - can't ask for much better. On top of that, my camera fizzled out 30 minutes before the start, so I had no excuses. I rode the bus out to Staten Island in the early AM, chatting with Hawaii ultrarunner Jeff Fong and local architect Philip Giang before finding some space under a tent to try and stay warm. Philip was nice enough to share his blanket as tens of thousands of runners came looking to homestead some space for the 3+ hour wait. Dunkin' Donuts coffee never tasted so good! In the corral, I met up with multi-day ultra champion Sean Meissner and 100-miler Bay Area stud Brett Rivers, and we cheered on the introduction of the elites. All the crazy fast people were here - Geoffrey Mutai (2:03:02 at Boston '11), Emmanuel Mutai (won London '11), Gebre Gebremariam (defending champion and 2:04:53 @ Boston '11), Meb Keflezighi ('09 champion), Ed Moran (10k national champ, going for his first marathon), Kenyan star Mary Keitany, Lauren Fleishman (5k national champ, doing her first marathon), Kim Smith (2:25 is fastest on US soil this year), Devon Crosby-Helms (go, Devon! ), and enough super-stars to have us all awe struck. This was a perfect day, and the hum of the crowd said records would fall for sure. Sean was feeling good, had done his speed work, and felt like a sub-6 minute pace was a good stretch goal to best his PR of 2:39. Brett just laughed, saying he was going to ease up and soak it all in (knowing Brett, this is probably a sub-3 marathon). I volunteered to hang with Sean for as long as I could, but as the gun went off, he zig-zagged his way through the crowd and blazed over the Verranzano-Narrows Bridge like an orange missile. I cruised along with Dr. Andy Baldwin, a Navy-doctor-turned-spokesperson and drafted off his gigantic muscular torso. Sean was long gone. The crowds filled both sides and both levels of the bridge, with elites dodging and cursing the 5-hour charity marathoners who somehow got to start up front. Within a mile, we all found our groove and enjoyed the peaceful calm of the waters below. It would be the last section of quiet we would have all day long. At mile 2, we entered Brooklyn and the locals greeted us with signs, screaming, music, cheering, and tens of thousands of hands waiting for high fives. It was 20 thick on either side, and this was just one of the streams of runners coming in from the bridge. When we met up with the other streams at mile 4, we were six lanes wide with spectators filling every window, rooftop, and park. BIG. Simply insane! I didn't have a watch, but the mile markers were telling me I was running 6:09 min/miles (sorry, Sean!). It didn't seem like I was running that hard, but the chilly air and crowd support was likely good for 10 seconds/mile. As we flew through Brooklyn to Williamsburg (mile 6), I saw Jamaicans, Irish football fans, and Hasidic Jews all dancing to Latina House music and cheering together. You gotta love NYC. As we pitched up into Queens, I found myself running in a pack of six and delighted in the fact that there were six countries between us - Brazil, Sweden, Italy, New Zealand, Mexico, and USA. We hit the halfway mark in 1:20:45, where the sub-2:40 hopefuls around us picked up the pace. Despite the language barriers of our little group, we rotated our leads and drafted as we took the Queensborough Bridge (mile 15) to Manhattan. Runners everywhere, unite! The crowds along First Ave were literally deafening, with rock bands, bars, megaphones, air horns, and anything else that could egg on a runner. There was no problem getting water at the aid stations though, and the top 500 runners barely took up the left half of the army of volunteers at each aid station. This marathon is a well-oiled machine! One of the runners next to me said that Mary Keitany had hit the halfway mark in 1:07:45 - 20 seconds faster than Paula Radcliffe on her world record run - and was still out front. 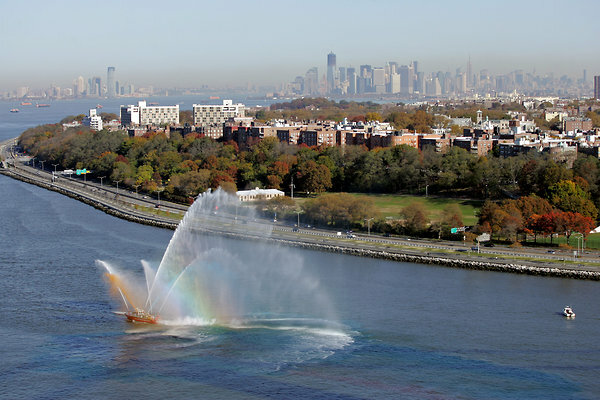 The men had a field of seven coming of the bridge, and were already turning into Central Park. Wow! 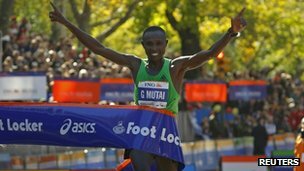 We took the Wills Ave bridge to the Bronx, and I was just in time to see Geoffrey Mutai on the big screen winning the NYC Marathon in a course record 2:05:06, with Emmanuel Mutai (2:06:28) and 24-year-old Tsegaye Kebede of Ethiopia (2:07:13) also coming in under the previous record (that's $70k bonus each!). Inspired, we dug deep and crossed back into Manhattan for the final push. About mile 22, my glutes were cursing the 2 degree climb, and I chuckled that even after 53,000' of vertical at Wasatch, these little rollers can be killer! 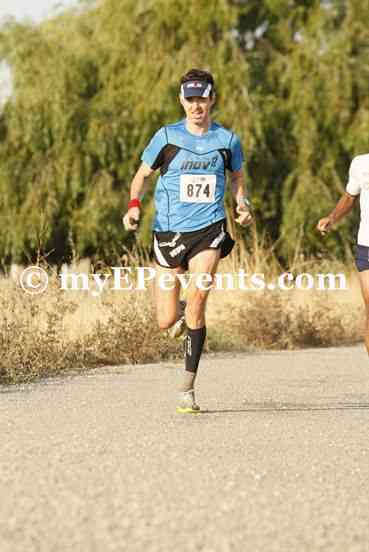 I passed up Sean, who had slowed to an 8:00 min/mile after 20 miles of sub-6...not his day, but certainly his destiny. As we closed in on Central Park, the carnage began, and runners started blowing up left and right. Mary Keitany had slowed, enabling Ethiopian Firehiwot Dado to pass in the last mile and steal the victory (2:23:15). Even Meb Keflezighi stopped to puke (but still managed a 2:09:13 for 6th) as I watched dozens of people hit the wall at the same time. It was like there was a sniper just picking them off! I kept my head down, shuffling along at a 7:15 min/mile into Central Park. Most of my international crew had enough left in the tank to surge and went for it. Now here was a stretch of Central Park that I have run dozens of times, and my body relaxed as it felt familiar ground. I checked the clock at mile 25...sub-2:50 was still in reach. I apologized to my body in advance, clenched every orifice as much as I could and charged down Central Park West. I don't remember much on this section, but luckily my friend Paige Alam and Kristin Armstrong were smart enough to bring an iPhone to get it on video. I crossed the line in 2:48:45, good enough for 376th place, and made my way towards the Amsterdam Ale House for some refreshments while congratulating many on new PR's brought by the perfect day. Sean finished right behind me (2:52), and Brett did manage to go fast (2:55), but the ultra community was best served by Devon Crosby-Helms (2:42) who managed to be 5th American and win her age group. Won her age group at NYC! That's wicked fast. Kik and Paige found me at the Ale House, and we shared some beers and fries while reminiscing about the spectacular marathon day. 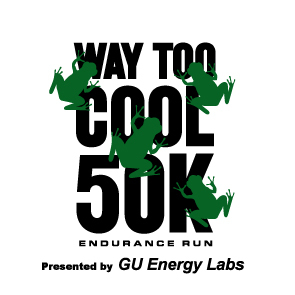 I have to say, this race is a "must" and worthy of your bucket list. Just be ready to go BIG! With that, I toast the finish to a wonderful 2011 season. Cheers! Here's a new twist on the trail run 5k - the Run For Your Life 5k not only has obstacles, but flesh-eating zombies along the course grabbing your "health flag". You gotta make it past them all to be eligible for prizes! Run For Your Lives is an apocalyptic 5K obstacle race. You’re not just running against the clock — you’re running from brain-hungry, virus-spreading, bloody zombies. Nice! A dozen city tour is already in progress...DO YOU HAVE WHAT IT TAKES?!? Imagine running 48 marathons in one year...and being only four years old. Now imagine that the weight of an impoverished nation rests on your little shoulders, as greed, temptation, and corruption come at you from all angles. This is the story of 5-year-old Budhia Singh from India, featured in a documentary called "Marathon Boy" airing on HBO on Nov 3rd. Set your DVR's, people! Sounds like a riveting tale. 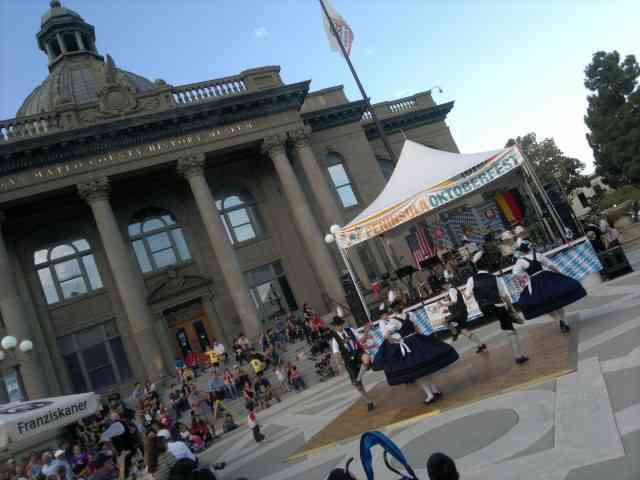 Props to the local geniuses who launched the inaugural Oktoberun Half Marathon/5k, a fundraiser race that starts and ends in downtown Redwood City, CA, and kicks off the local Oktoberfest celebration. I had a great time, and easily ended the morning "calorie positive" with all the great beer and German food. Such a fun event! The race was a local affair, big enough to raise some $$$ for the Redwood City Education Foundation, but not so big that we couldn't park right next to the start. The day was perfect for running, and ~300 of us eagerly chose the half marathon to take advantage of the sunny 70 degree morning. I caught up with friends Shira Shane (just back from a summer in Jordan), Warren Packard (recent born again entrepreneur), ultra star Erika Kikuchi (with me feeling the need to apologize for staring endlessly at her Web page - I dare you not to! ), and super master Kermit Cuff before we were called to the line. With a raising of (empty) mugs, we were off! Local Jesus Campos quickly made his way to the front, joined by John Munene and a half dozen others well under a 6 minute/mile pace. The local police routed us through downtown and over the highway to a bike path that weaved along the waterway, where Munene found a ridiculously fast gear and headed out on his own. He managed to take the correct path, while about 30 of us took a half mile detour through a parking lot...gotta look for that chalk! Warren Packard timed it just right, getting everyone else back on track as the rest of us shrugged our shoulders and said thanks for the "bonus miles." Honestly, if that's the only wrong turn in an inaugural race, they are doing a stellar job! Campos went a bit farther off track than the rest of us, but quickly turned his frustration into a banshee blur and flew by all of us. I settled into a rhythm with Roheem Moore, an Air Force pilot finishing up a 140+ mile/week and looking great, and we traded off pacing a 6:10 min/mile groove, picking up a couple of spots along the way. I could see Kermit Cuff 30-40 seconds ahead of us as we hit a long straight bike path (mile 4) but we weren't gaining any ground yet. If I knew Kermit, he would hold his pace to the end! The happy volunteers steered us onto the last out-and-back section along the Bay, where we could see Munene waaaaay out front and Campos finding no challengers for second place (or first place for the 14-miler, depending on how you look at it). We hit the turnaround, and Roheem eased up a bit to enjoy the warm breeze. Shira was looking great, well on her way to a half marathon PR despite no training in Jordan, and a smile big enough to prompt every single guy to ask her about her status. I tried a few 30-second sprints to reel in Kermit, but each one only got me a few seconds, and I had little runway left. As we crossed the highway one last time (mile 11), I realized that 4th was my destiny and eased up to give some high fives to the beer-clad residents. Yummm...just a few more miles for some alcoholic carb replenishment! And with that, the Oktoberfest celebration began, with huge steins of beer, lots of great food, and The Internationals and Golden Gate Bavarian Club busting out authentic Oktoberfest song and dance. Thanks so much to the volunteers and race directors for bringing back a downtown half marathon, and throwing the best finish line party around. I will be back next year for sure! Just finishing up a 12-miler in Purisima Open Space Preserve on a beautiful Saturday morning, and there it was...just a couple of feet sticking out of a grassy section, and a perplexed fingernail-biting cyclist who had clearly recently stumbled upon it. 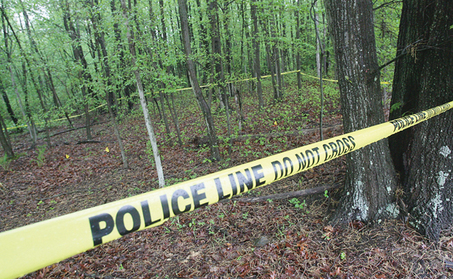 Before I could even get a few words out, the Sheriff was making his way down the fire road in his cruiser and pulled out a body bag. Whoa. The police quickly summarized it looked more like a suicide than an accident. I selfishly thought "that's too bad...he missed one of the best sunrises all year long". But I suspect he was in the shadow of bigger demons. So in case this doesn't go without saying, if you're thinking about ending it all in one of the parks near my neighborhood, at least wait long enough for us to have one more sunrise run and a breakfast beer. It just might be enough to live for. 100-year-old Fauja Singh became the oldest marathoner in the world when he completed the Toronto Marathon in eight hours and change this weekend. He was "thrilled" with his performance, and was the last official finisher. 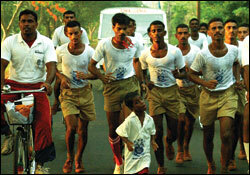 Singh also broke eight world age group records along the way. 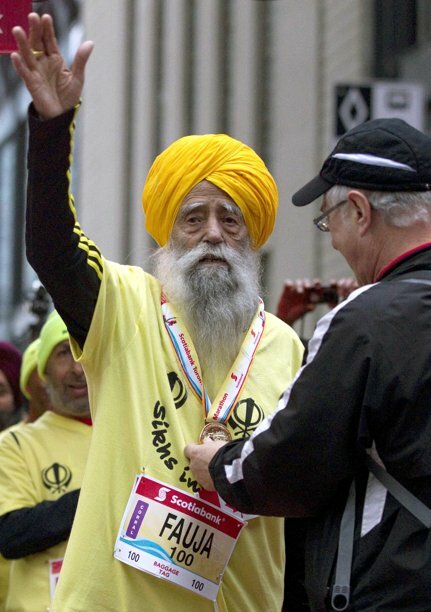 Sunday's run was Singh's eighth marathon — he ran his first at age 89 — and he's now setting his sights on carrying the torch for the 2012 London Games. This guy is amazing! Congrats, Fauja! Age is nothing! In a simply shocking demo of Adobe's new "unblur" capability for PhotoShop, the below video shows how a new algorithm can determine the motion of the camera that caused the blur while the shutter was open, and correct it. Voila, a clear picture! For guys like me who get 100 blurry photos for every one that works, this is a miracle. Don't throw away those blurry photos, folks! Australia's Craig Alexander had a "perfect day" on the big island of Hawaii this Sat, claiming his 3rd Ironman World Championship with a course record 8:03:56, and becoming the first athlete to ever win both the 70.3 and Ironman World Championships in the same year. Oh yeah - he's the oldest winner too at age 38! Alexander was so focused on his race, he didn't even realize he was going to beat the course record until he heard announcer Mike Rielly say "I think he's going to make it!" and sprinted for that crucial 13 seconds. Wow! Experts attribute his course-setting race to his phenomenal peak shape, a bike split that was 13 minutes faster than any of his previous races, and a 2:44 marathon that put him in the lead by mile 6. Ironman rookie Pete Jacobs, also from Australia, was second in 8:09:11. Germany's Andreas Raelert was third in 8:11:07 after being in the Top 3 for most of the race. Britian's Chrissie Wellington (8:55:08) added a fourth crown to her collection after chasing down early leader Julie Dibens at mile 16, and then barely holding off 2nd place finisher Miranda Carfrae (8:57:57) who had bested her marathon record while in hot pursuit. Wellington was still healing from a bike crash just two weeks previous, and was very pleased to have enough left to win. Leanda Cave (9:03:29) held on for third after being in the Top 5 nearly all of the day. Another great race from the Ironman World Championship. Looking forward to that NBC special! "World Best" vs. "World Record" - Wha? Last month, the IAAF (track and field's international governing body) ruled that, in women's marathoning, only times recorded in women-only races would qualify as world records. If a faster time is run in a mixed-gender race, it's now a "world best". 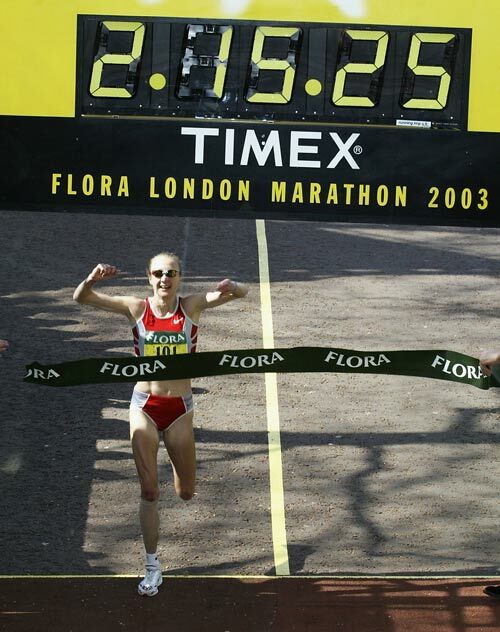 So Paula Radcliffe's 2:15:25 in London in 2003—set in a mixed-gender race and aided by two male pacesetters—has become the world best, while her time of 2:17:42 in London 2005—in a women-only start—is the new world record. WTF?!? Very confusing, I think, and seemingly unneeded. If the course is sanctioned as 26.2 miles, should it matter? The SF Chronicle says the ruling is insulting to women. 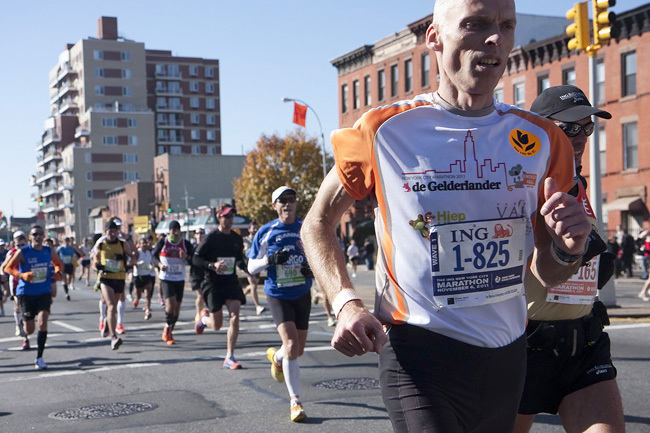 The World Marathon Majors says it's confusing. Radcliffe says it's unfair. But many agree a male pacer is worth about two minutes. The New York Road Runners media team has a great "head to head" debate about this topic featuring Neil Amdur, former sports editor of the New York Times, and Tim Hutchings, a British Olympian and TV commentator. It's worth a read.